Oops! Mookite, sorry. I really should know better since Grendel sent me a link to Mookite, really cosmic looking rock though. As for the bows, I thought it was rawhide. I've just been given vols I + II of the traditional bowyers bible which is a fabulous piece of work, rawhide as a backing features a lot. Did you use hide glue or something else to stick them down? I've used hide glue before on rawhide bakings, but I think I used wood glue on these bows.... Soak the rawhide first, before applying. I used wood glue on snake skin backings too. Aha! Very good to know wood glue works for rawhide backings for bows. Let me know if you need any rawhide, the thinner the better. I think I've got some fallow hide in the workshop. As for your friend, he is a lucky dude. That bow looks awesome. I'll post some pics of the new bone tipped long bow if you would like a gander? It will take a few days as my camera will not work somehow with my crap computer but there is a way! Yeah, I'd love to see! I'd only back an adults bow with rawhide if I had too! Rawhide doesn't add to performance, if anything it slows the bow down... Sinew of course is a different matter! Yeah, he was hunting with jim Hamm, who is the editor... They wanted to use my friends arrow for the cover, bust didn't hit the deadline.... The bow is made by Tim baker, I think a wild plumb sampling bow! Native, I've posted the pics of the new bow under the Making a longbow topic, enjoy! Hi Native, just wondering if you've ever used European Beech (Fagus Sylvatica) to make a bow? The story goes like this: A couple of weeks ago I went to the local timber yard in search of sutable bow wood, to my pleasent surprise they stocked Ash and American white Oak, the latter I've used as you know. Ash was something I wanted to try out but all the boards had wonky grain so I went through all of the white oak and found one with lovelly striaght grain at the dimentions I was after. This was at about 4:15 in January and the light was faiding fast, and the piece of wood I eventually bought looked a little different to what I had in the past. I took this to be natural variation untill a day later in full sunlight I saw that I had Beech instead! The staff managed to miss this too. The wood is really heavy and the specific gravity is close to Yew, It would be a shame to give up on this wood as I've started to shape it into a flat bow. Hello. so sorry for the delay in getting back to you! I've not tried beach yet and have also heard that the Americans don't like there variety. i would give it a go though! I've heard for years that willow makes a terrible bow but I've seen plenty of good made! are you sure its beech and hot hornbeam? that makes an excellent bow! Ah Native, and I'm now late getting back to you! I'm sure it's Beech and I've looked at the Wood database for facts and figures and sure enough American Beech is not as good as English Beech and the latter actually looks ok for a bow, specific gravity, modulus of rupture and elasticity look much better than thier species. I'm going to carry on and I'll post some pics of progress of the new beast on Monday. Well this is the beech bow so far, I've now worked the bow down on the belly and given it some string nocks. The tiller awaits... I got some natural flax fibre and I'm in two minds whether to back it with that and some wood glue, I would think nettle would serve well as a backing too. Just as a precaution I've made it uber long at 74", more wood to spead the load I guess, if it pulls too light I can always shorten it. Looks an interesting design ... It will be super fast when tillerered! Be careful of the last third of each limb... Pyramid bows can easily develop a whip tiller! How long are your fade outs? May I suggest you lengthen them some what to avoid hinging near the handle. Or is it a working handle? If so, forget that I said! It is a little odd, It's the first build-along in Nickolas Tomihama's book "The beginner's guide to building bows" and its the half pyramid design so the measuerments are the same as his although I've left it much longer. The fades are slightly misaligned to the handle cut-ins but not by much and the thickness is constant along the limbs so you get a slight visual illusion with the side taper that looks like it gets thicker towards the tip! Is there supposed to be two photos? I can only see one. Whats a half pyramid design? I only posted one picture and rambled on a bit! Who knows what a half pyramid design is, I'm kinda new to bow making and when I've been talking in an archery shop this is rather apparent, eek! That's what Nickolas calls it in the book, I guess its a pyramid bow bit a little less wide and flared near the handle. You're right, I should post a pic of the belly to see what I'm gabbling about. Native wrote: Let me know if you need any rawhide, the thinner the better. I think I've got some fallow hide in the workshop. Now I've had a little splinter raise (my fault) on the inside edge of the handle I think it might be time to get some rawhide! How much for a couple of bows? And do you part with any exotic knapping rock btw? As for the bow, I'm not enjoying this build so far... I think flatbows are odd and very "blocky" looking. I reserve the right to change my mind though once I round off the edges. He he. You should be ok if it's in the handle as it doesn't bend. I'm away from my workshop for a couple of weeks... I'm sure I must have some rawhide though. If I have plenty, I'm more than happy to send you some. Just pm me your address. I havnt got that much non UK rock... Maybe a little bit obsidian, I'm more than happy to trade that, I'm not really a fan of it... I'll have a rummage the next time I'm at the workshop. Oooh thank you on both counts. Keep me posted when you know. The split raised as it was bending through the handle a little more than I was comfortable with, that and I didn't round off the edges enough. School boy error. Thank god for glue.. So sorry for the two year delay in replying! How did the bow turn out? Do you still need rawhide? Native wrote: So sorry for the two year delay in replying! How did the bow turn out? Do you still need rawhide? So true, be sure to post some more of your work in an epoch or two.. He he, too true chaps, James, the bow was a bit of a flop but is still shooting. 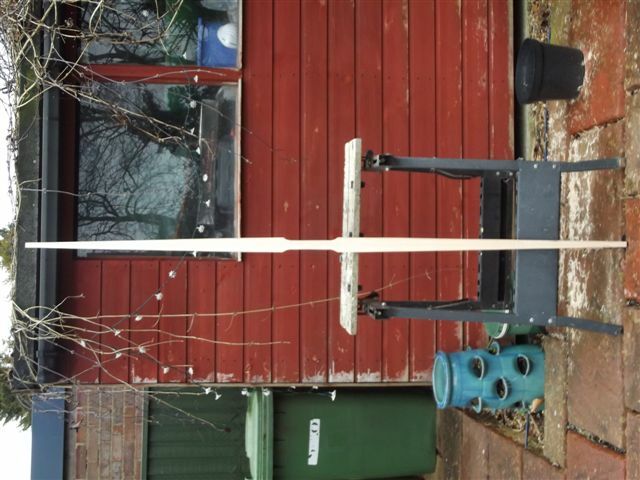 I posted the (nearly) finished result in the making a longbow thread on this site. If anything this project was a great learning curve for me, it was the first flat bow I'd made and it taught me to have good fades from the handle, and NEVER to make a bow from Beech again, its wood fibres are too short for a bow, and both limbs after tillering developed a maze of chrysals which I bound with fine linen thread and wood glue, this seems to have done the job.